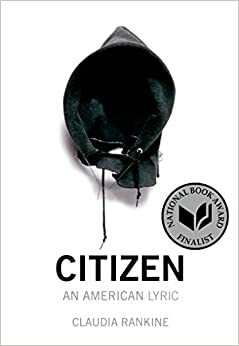 Claudia Rankine's Citizen intimidated me because it is a book of poetry and essays, often with references to modern art, video collaborations she's worked on, and past events. I do not read a lot of poetry, and I worried that I wouldn't get as much out of this book as Rankine put into it. That I wouldn't really "get" a lot of what she referenced if I didn't know how to approach and analyze art. But Rankine spends the bulk of Citizen discussing microaggressions, those small, subconscious acts we do that speak volumes about our beliefs and can lead to so many misunderstandings. She talks about a friend who, for some inexplicable reason, referred to her as a "nappy-headed ho." Cashiers who ask only black customers if cards will swipe without issue. People never taking the available seat next to a black man on the subway. Colleagues assuming that Rankine only got her job because of her race. One of the situations that stood out most to me was when Rankine had her (black male) friend babysit her children. People thought her friend, taking a phone call outside the house, looked suspicious and called the cops on him. After the incident, even Rankine mentioned to her friend that perhaps in future, he should take his calls in the backyard, not the front yard. Her friend looked at her for a long, hard moment, and then told her he could take phone calls wherever he wanted. Rankine spends quite a bit of time at the start of the book discussing Serena Williams. I found this entire section absolutely fascinating and eye-opening. As I am writing this on Super Bowl Sunday, I would say this section made me think of the way people complain about Cam Newton being too celebratory when things go his way. People think this is unprofessional. They generally don't mind when white football players celebrate, though. Serena Williams' displays of emotion on the tennis court have rubbed many people the wrong way. Rankine digs deeply into this, into the way the Williams sisters respond to criticism, into the number of times they have felt rage but had to shake it off. Because calling people out on things like that is unsportsmanlike behavior. You can't bring up subconscious racism in professional sports; people think you're just being a sore loser. There are so many moments like that in this book, and I am so glad that Rankine wrote about them because they make racism more personal, more approachable. I became more reflective. How many times have I perhaps stood by and watched someone be stereotyped against? Why didn't I speak up, show my support for the victim? What can I do to make my world a more welcoming and kinder place for people who do not feel safe or valued? There is a poignant free verse essay/poem in which Rankine describes how she got on a train and saw that everyone avoided sitting next to a black man. She went and sat next to him, did not make eye contact or interact with him in any way. She just wanted to show solidarity. She wanted him to know that she saw him. It was very moving to read. Usually, I stand on public transportation. Mostly because I think the seats are probably pretty disgusting. But the last time I got on a train, I too noticed that many of the seats next to black men were empty; people chose to stand instead of sit. So I went and sat down. And, surprisingly, the man turned and smiled at me, welcoming me to the train or to the city or just greeting me, acknowledging my presence and our shared space. I smiled back. I like to think that Rankine inspired a moment of connection in a situation that most often is one of silent anonymity. Hopefully, the book will inspire many such connections. If possible, now even higher on my want list, because of your review. I don't buy a lot of books, but I want to buy this one because I don't think it will be the same at all in ebook. Yes, I absolutely suggest reading this one in print form, especially because I think she chose the spacing and facing pages specifically to be set up the way they are in the book. I don't imagine that the e-book would do justice to that, unless you can view two facing pages at once. And in full color. That "nappy-headed ho" comment literally took my breath away - and then to read some of the other cluelessly awful things people have said. I was also a little intimidated by this book, and I ended up dipping in and out of it, rather than reading straight through. I need to sit down with it again. I need to reread the sections about Serena Williams. I read and enjoyed them, but I think they'd be even more interesting (and infuriating) to read now with the context of Cam Newton, who plays a sport that I follow regularly. It's stunning to me that there are people who can't see the racist tinge to so much of the coverage of Cam Newton, even down to how often he (and ALL BLACK QUARTERBACKS) get called "athletic" vs. for instance "intelligent". This is so on my list and I think I will buy it rather than check it out from the library. That poem about the empty seat on the subway was incredibly moving. I just listened to the audio book of Citizen and it was eye opening and shocking. It's not often that I take public transportation, but I will be in Chicago in May for BEA/BookCon and I do plan on being aware if there are empty seats next to people of color, especially black men, to make an effort to take a seat instead of stand. Interesting that we both had that same take away from that section about black men on public transportation. I also had an incident where a middle aged white man whispered to me in line at a gas station "When are women going to start wearing their pants like that?" He was referring to a young black guy who was wearing his jeans sagged. I said nothing. I just didn't want to cause a scene before I had to be at work. It kind of bums me out that I was somewhat afraid and didn't have the energy to call out that racism. I had so much love for this one. It was hard to review, but I threw myself into it because I want EVERYONE to pick it up.